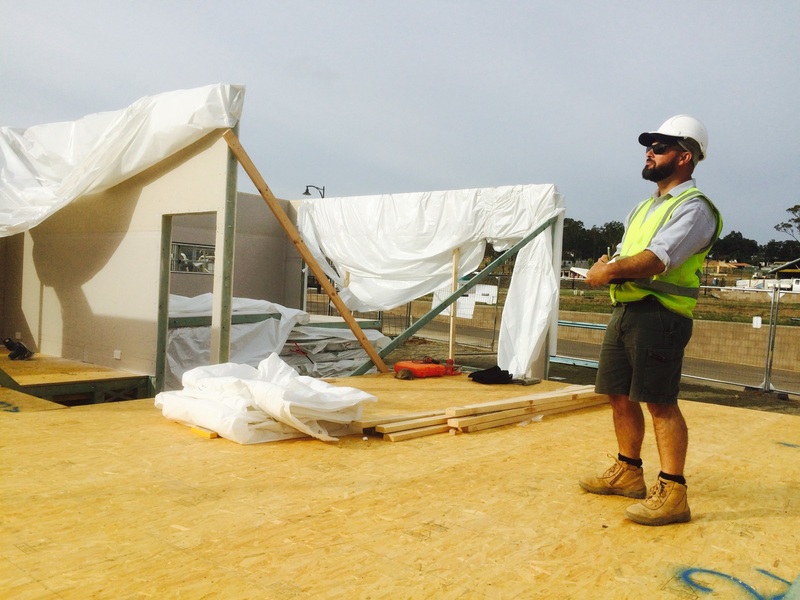 December 2015 saw the successful completion of DWTT – FutureFit™ first fully closed wall panel prototype home. Working collaboratively with the client to develop a fully ‘closed panel’ wall system consisting of external cladding (EPS – Masterwall™) ready for render. Internally, rough-in of plumbing services,electrical incorporating power, data and light switches, R2 insulation and plasterboard. All Windows and external door frames were also pre-installed into the ‘closed’ wall panels. The Prototype, a 203m2 single storey house on a screw pile stump & bearer platform incorporating our floor cassettes, closed wall panels and roof truss products to ensure speed and accurately of the install process. The high complexity of this initial prototype and the long distance to site (1,400kms) provided additional challenges, however the project was an outstanding success with the FutureFit™ system being installed and handed over in 4 days. Day 5 saw the safety railing going in followed by Facia and Gutter. Day 6-7 saw the Colourbond™ roof installed and lock up stage passed within 7 days as the majority of the carpentry, electrical, plumbing and plastering work had a completed in our closed wall system. This prototype was a new, exciting and a challenging project to undertake and the FutureFit™ – Team learnt a great deal from the experience. The project ran smoothly and the experience, knowledge and techniques developed will enable us to make continual improvements to our FutureFit™system to increase speed and efficiency for future projects to come.